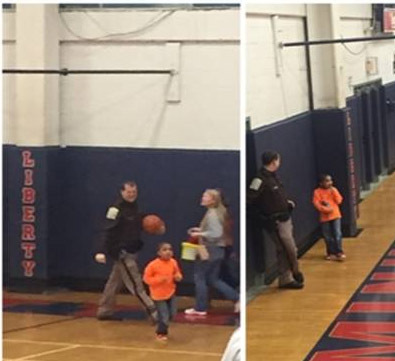 I went to Liberty High School last night (Monday) with my son who is 7 and my in-laws. We went to watch my oldest son and his team (Heritage High School) play varsity basketball against Liberty at 7:30pm. Your deputy that was on duty there last night for the game was the nicest, deputy I have ever encountered at a school. He had a smiling face from the time he opened the door for my little boy to enter the building until we left the gym. He has left a lasting impression with us. Your deputy spoke to him and they talked at times during the 2 hours we were there. They even high fived a couple of times. I failed to look at his name badge. Hopefully you will know who it is from the pictures. You should be proud to have him on your team!